‘The Girl From Ipanema’ may have created the Space Age Bachelor Pad musical sub genre on it’s very own, quite by accident. What started out as rather lengthy bossa nova jazz rendition by Stan Getz and Joao Gilberto, with an Astrud Gilberto vocal feature rather far into the song’s album version, was eventually rearranged and edited down to a brilliant worldwide hit. 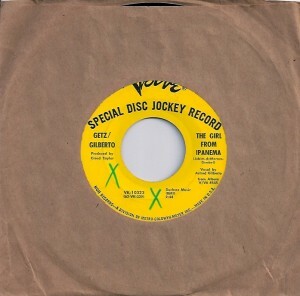 Seek out the single version, streamed above. It’s concise and in my opinion, far superior to the long full length counterpart. Then there’s the near extinct picture sleeve. Don’t ever pass that up. Several years back, Astrud Gilberto played a night at SOB’s in NY’s West Village. I’d seen the listing, and lazily intended to attend, until day of. Suddenly, getting home and sinking into the sofa sounded way better. For whatever reason, I thought, just do it already. So last minute, left the Island office and walked across town, only to find the club oversold. Now the juices were flowing. Where there’s a will, there’s a way. Two days later, Island’s King Sunny Ade & His African Beats were scheduled. Without shame, I pulled out my Island office ID and forcefully played the guilt card. 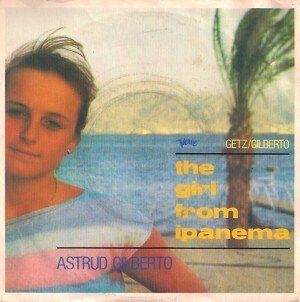 This entry was posted on Saturday, September 3rd, 2011 at 12:01 am	and is filed under Astrud Gilberto, Joao Gilberto, King Sunny Ade & His African Beats, SOB's, Stan Getz, Verve. You can follow any responses to this entry through the RSS 2.0 feed. Both comments and pings are currently closed.